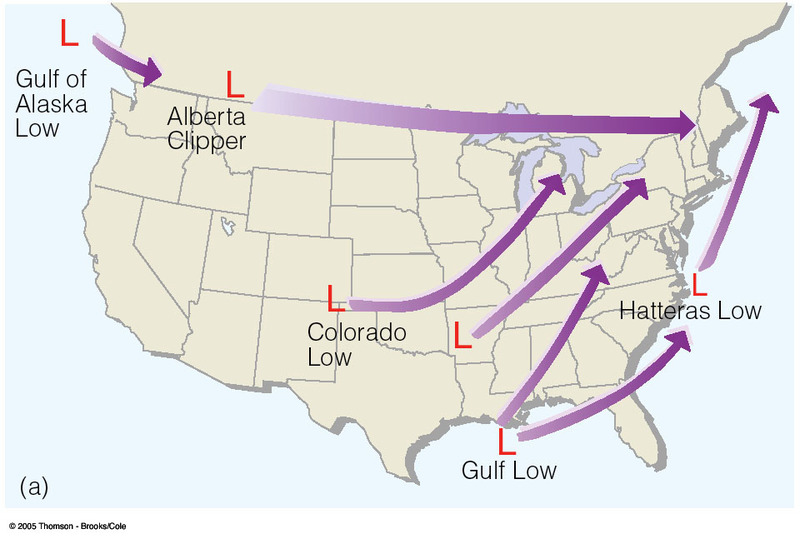 What is a mid-latitude cyclone? Here is a picture of a typical mid-latitude cyclone and hurricane. Notice the size difference. 2. 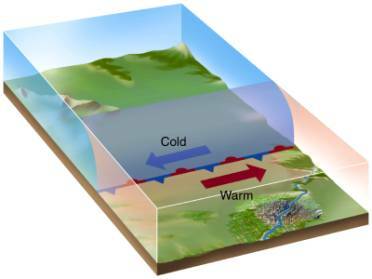 Along this boundary a counter-clockwise circulation can set up at the surface, which acts to take warm air up from the south and cold air down from the north. 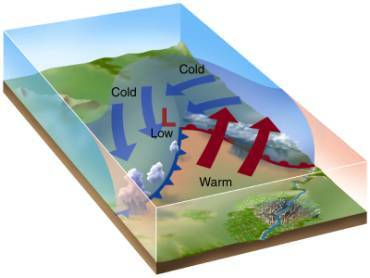 This is called cyclogenesis. 3. In the center of this circulation, there is mass convergence (all the air is moving in toward the center of the circulation much like when you make a whirl-pool in a pool, all the leaves and stuff floating around moves toward the center). When all that air hits the center, we have rising motion because it has nowhere else to go. 4. If the upper levels are favorable for cyclone development, then there is a region of divergence aloft above the developing Low-pressure center. 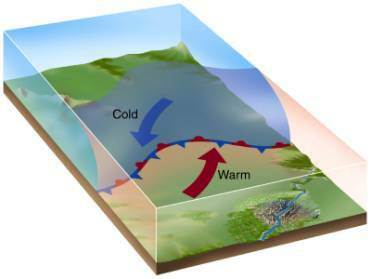 This will help pull the air that is converging at the surface upward and continue to develop the surface cyclone. 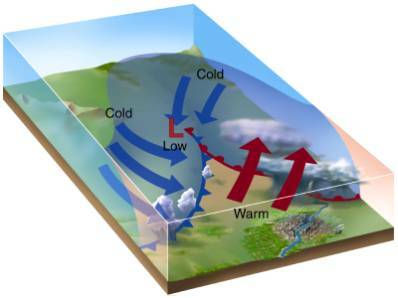 (The upper levels also steer the system and make it progress east (like we learned earlier)). a. If the upper levels aren�t favorable for cyclone development, the cyclone won�t grow and the mass convergence into the Low at the surface will just pile up and fill in the Low and it will decay. b. Refer to the second figure below for the optimal situation. 5. If the upper levels are favorable, then the mid-latitude cyclone will continue to develop and bring up mT air in the warm sector and bring down cP air in the cold sector. i. 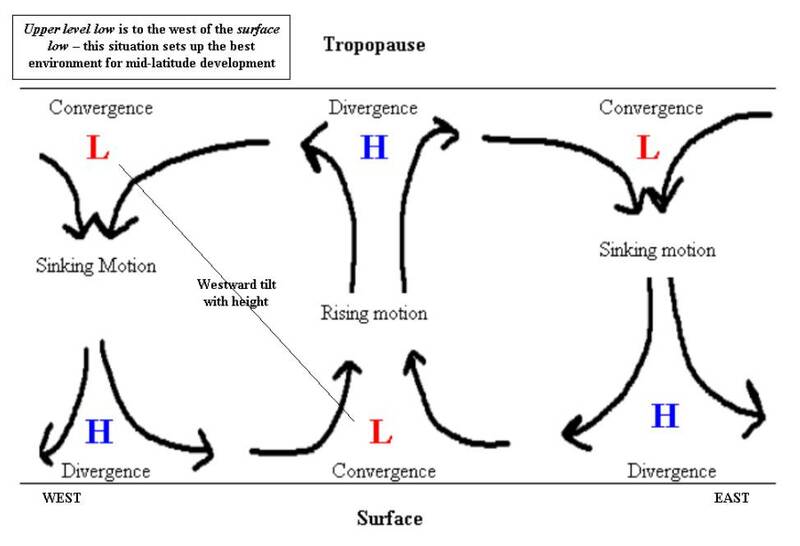 It is this transfer of energy that both strengthens and propagates the mid-latitude cyclone! 6. 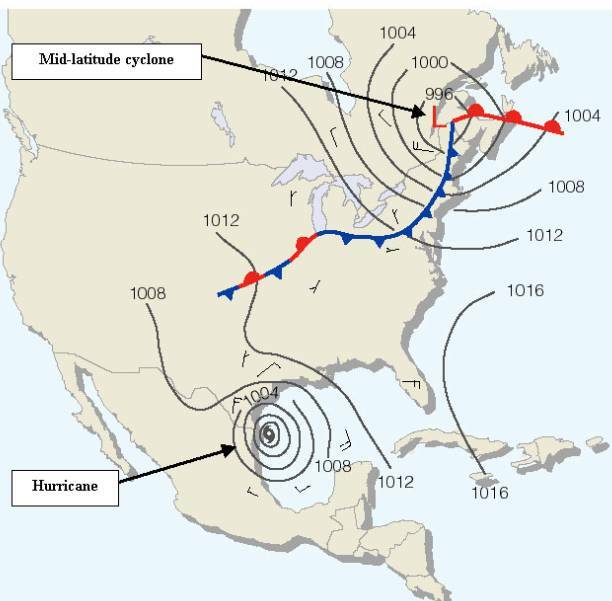 Once the mid-latitude cyclone is fully developed, well-defined fronts appear. 7. 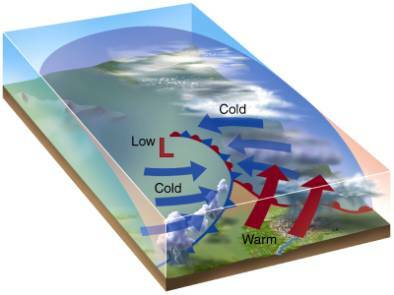 As the mid-latitude cyclone reaches maturity, the central pressure will be at its lowest and the occluded front will begin to form (as the cold front catches up to the warm front). 8. 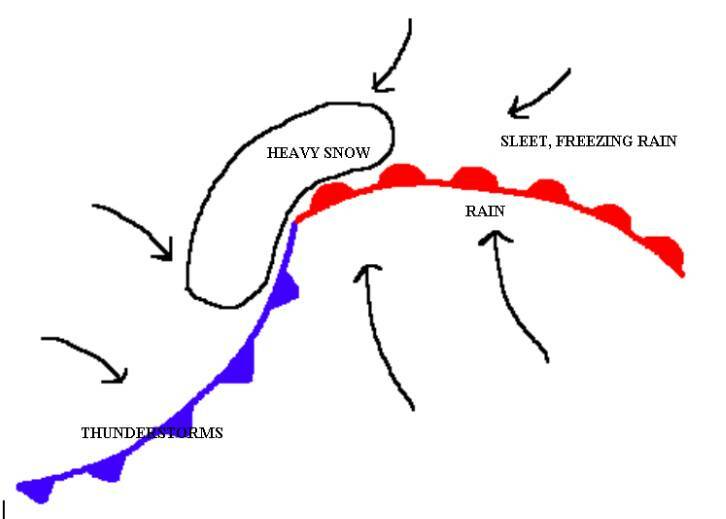 Once the system is occluded (all the warm air is above the cold air) the mass convergence acts to fill in the Low and therefore the pressure increases in the Low and the system decays. � These are the MOST INTENSE systems and they form along the thermal boundary between the warm Gulf Stream and the cold Atlantic coast. They can bring flooding rains along the coast and several feet of snow further inland as they use the ocean as a vast source of the moisture. These also develop very quickly and sometimes have pressure drops of 24mb in a single day. With a pressure drop of this magnitude you can imagine how fast the winds are around these things. 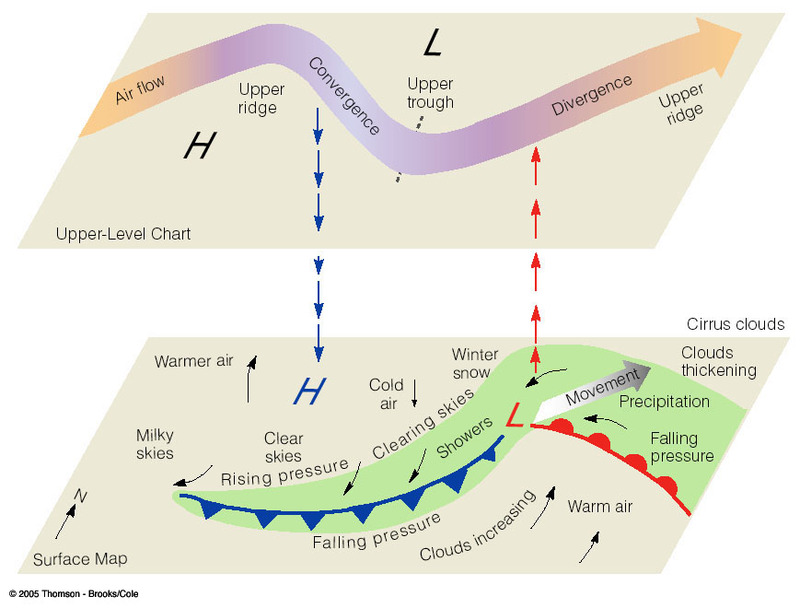 Precip patterns (and types), winds, temperatures, fronts, upper level flow and clouds that are around a typical mid-latitude cyclone in winter.